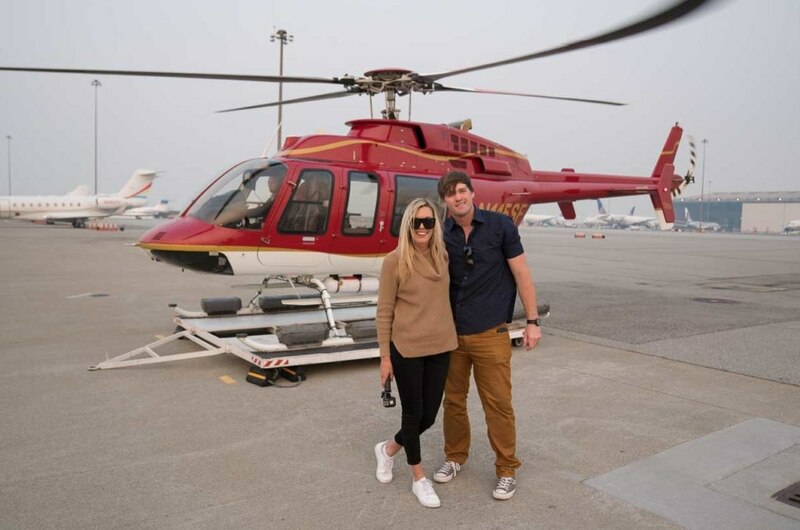 Hannah and Adam of Getting Stamped are known for seeking out the world’s best beaches and luxury escapes. That’s why we asked them to take the Seeker Project, a revolutionary travel “quiz” created by Le Club AccorHotels that uses behavioral analytics to help connect travelers with their ideal destination. Read on to learn how they found what they were looking for in San Francisco thanks to the Seeker Project. Hi Hannah and Adam! Thanks so much for joining us today! Can you tell us a little bit about yourself and how you got into travel blogging and photography? We’re glad to be here! We started our travel blog Getting Stamped in 2012 and quit our jobs to travel full-time in 2013. We both were burnt out at our corporate jobs and we never had enough vacation time to travel. Early on in our relationship we discovered our love of travel and quitting our jobs to travel the world for a year was a dream come true. Our one year trip turned into five years and counting! Adam is the man behind all the pretty pictures and videos on our Instagram. Adam’s photography has grown since we first started and so has our camera gear, but it’s all worth it. Our travel style is best described as adventure luxury. We enjoy going out exploring during the days and staying somewhere luxurious so after a busy day we can just relax at the hotel. A typical trip we reserve a day to enjoy the hotel and everything it has to offer the spa, pool, breakfast in bed, etc. The Fairmont San Francisco Hotel fit our travel style perfectly; we would never have to leave if it wasn’t for our adventurous side with a bucket list of things to do in the city. Your most recent trip was pretty special because of the Seeker Project. Can you tell us a little bit about that quiz and how it paired you up with your dream destination? Our Seeker Project trip was the perfect 3 day weekend in San Francisco. We fell in love with the city years ago on our first visit, and it always feels great to be back. There is so much to do, see, and eat in San Francisco. Adam got to get outside and hike to some great photo spots like Marshall’s Beach, and I love the city’s vibe with all the shops, restaurants, and bars. Did you both take the Seeker Project quiz? Did you get similar results or were the results very different? Yes, we both took the Seeker Project quiz. We both love the beach, but Hannah tends to lean more towards cities while Adam is drawn to the mountains. We enjoy exploring destinations that are a good mix of both, so San Francisco was a perfect match. The Le Club Accor Hotels brand really sets itself apart from other luxury travel brands with its unique services. What made Fairmont San Francisco Hotel property stand out to you? As soon as we drove up to the Fairmont San Francisco Hotel it set itself apart with its grand lobby and the building itself is stunning. The hotel is full of history and it’s the first ever Fairmont property. We enjoyed checking into our room and having a bottle of champagne already on ice for us to get our trip started. Before the Seeker Project, would you have considered staying at the Fairmont San Francisco Hotel — or did your results open new possibilities and ideas for you? We totally considered staying at the Fairmont San Francisco Hotel because it’s in the perfect location and within walking distance to so many of the best things to do in San Francisco. We now know where we’ll definitely be staying on our next trip to San Francisco. With the Fairmont San Francisco Hotel as your base, what were some places you got to seek out? Battery Spencer – We had seen some amazing photos on Instagram of the Golden Gate Bridge and knew we had to go visit. Our last sunset in San Francisco we took an Uber over to the Battery Spencer for an epic sunset and to get some great photos of the bridge. This is, in our opinion, the best place view of the bridge. 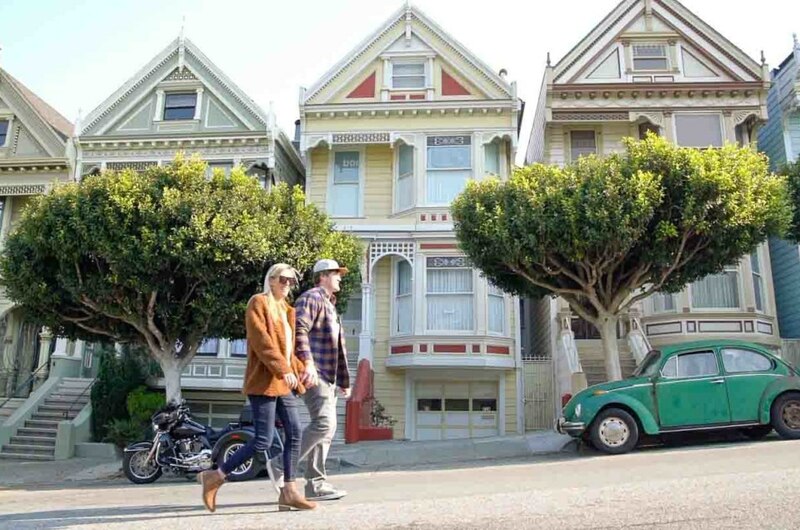 Painted Ladies – Not only are the Painted Ladies picturesque homes of San Francisco with the city in the background but also home to one of Hannah’s favorite shows growing up, Full House. Helicopter Ride over the Golden Gate Bridge – There is something about soaring high above. We’ve been in helicopter rides all over the world, so we always try in get up in the air when we can. Never in our wildest minds did we ever think we’d fly under the Golden Gate Bridge in a helicopter. This was the coolest tour we did in San Francisco. As a photographer, what were some of your favorite Instagram-worthy moments from your trip in San Francisco? Our favorite Instagram spot to catch a cable car going up/down the hill on California & Powell just steps outside the Fairmont San Francisco. The best time to get the perfect Instagram is early in the morning just after sunrise. The light is great and traffic is light so getting the shot in the street isn’t as hard. Battery Spencer was our favorite viewing point for those iconic shots of the Golden Gate Bridge. We suggest going about an hour for sunset and staying til it’s dark out. It’s a great spot for sunset and many people don’t leave right after the sunsets. What about inside the Fairmont San Francisco? Any places guests should keep on their radar? Inside the Fairmont San Francisco is one of the coolest Tiki Bars in the world, the Tonga Room & Hurricane Bar. Plan an evening with dinner and drinks at the Tonga Room with live music and Pacific Rim cuisine. The rum drinks are dangerously good, but thankfully our hotel was just an elevator ride away. If one of our readers only had 48 hours in San Francisco, what are three must-do experiences they should try? Check out the Golden Gate Bridge — whether it’s a helicopter flight over it, walk over, or take the hop-on-hop-off bus. We would suggest walking across if you’re not afraid of heights and going to one of the viewpoints near Battery Spencer for sunset. Eat in Chinatown – Some of the best Chinese food outside of China can be found in San Francisco’s Chinatown which is the largest Chinatown outside of Asia. Ride a cable car – This is a must, and while you’re on one make sure to catch a good photo too. If you only have a few days, we suggest getting the multi-day cable car pass to help you maximize your time in the city. What are your top tips for missing the crowds during a visit to San Francisco? 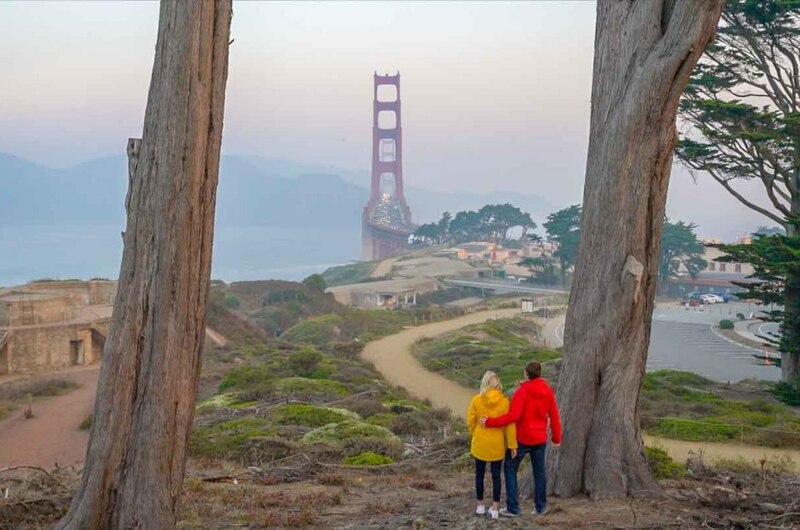 When visiting a popular tourist destination like San Francisco it can be tough to miss the crowds but we found getting up early and out exploring is so worth the alarm clock. At least one morning head out before sunrise either to get some iconic photos like we did or just enjoy the sunrise and watch the city come to life. We suggest grabbing a coffee at Caffe Centro first to fuel the morning. If you’re schedule allows avoid holiday weekends and weekends if possible not only for less crowds but typically better prices. Why should travelers try the Seeker Project? All travelers should try the Seeker Project because it’ll most likely lead them to destinations they possibly never knew about or never thought about going to. Some of our most favorite places in the world were places we learned about from other travelers and weren’t on our bucket list. There are so many amazing places in the world to explore let the Seeker Project suggest your next trip. You heard them! 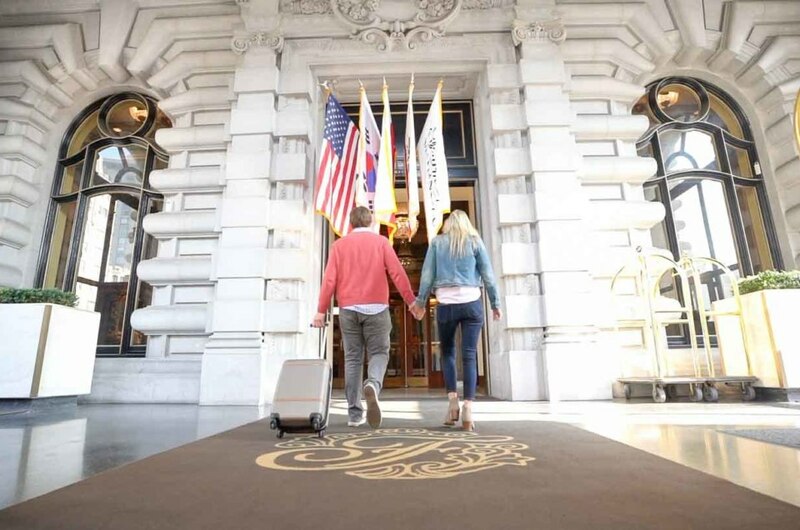 Adam and Hannah used the Seeker Project to find their dream getaway at the Fairmont San Francisco Hotel — and so can you. This unique quiz, brought to you by Le Club AccorHotels, uses behavioral analytics to help users find their dream travel destination. Click here to take the quiz to discover the destination your heart truly seeks.